John Stuart Mill was the 19th century’s most important English-speaking philosopher, though the word “philosopher” alone doesn’t quite capture the extent of his influence as an economist and as a political and social theorist. 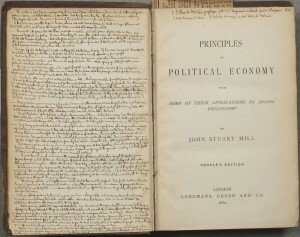 Originally published in 1848, Mill’s Principles of Political Economy served for many years as the standard economics textbook. 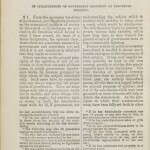 The MIT Libraries own the 1848 first American edition of this classic work, but our copy of the 1880 “People’s edition” is a bit more interesting. 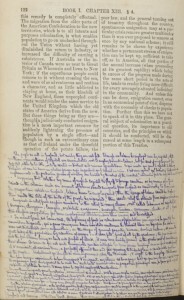 It serves as a testament to one book-owner’s personal and highly specific brand of “economy”: squeezing the maximum possible number of handwritten words into the smallest possible space. The book was a gift to the Libraries from Lloyd Rodwin (1919-1999), Ford International Professor Emeritus of Urban Studies and co-founder of the MIT-Harvard Joint Center for Urban Studies. 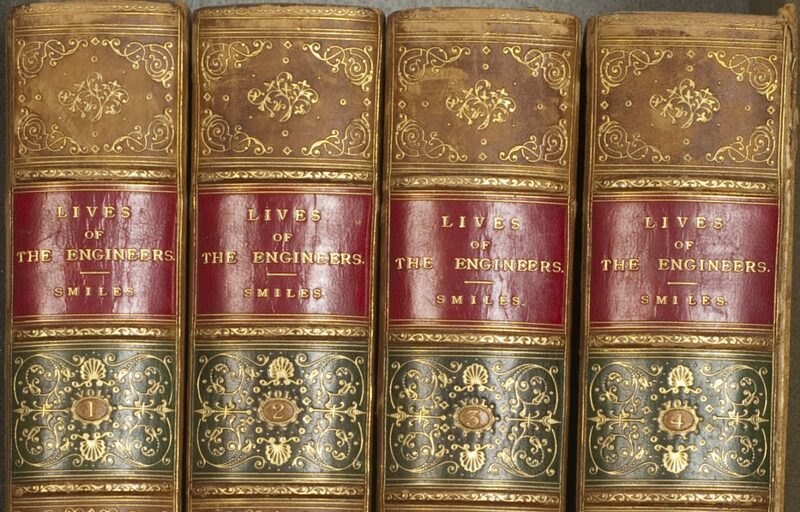 But long before Professor Rodwin gave it to the Libraries, an earlier owner had truly made the book his or her own. The volume is pretty badly beaten up; the spine is gone and the covers detached, and it’s hard to tell who the earlier owner might have been. 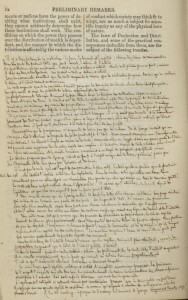 But whoever it was seemed to be comfortable writing in French as well as English, writing in very small script, and writing … and writing … and writing. It’s unlikely we’ll ever know who marked up the volume so thoroughly and so painstakingly. But it’s wonderful to be granted such a clear view of a reader’s thought process and reading history, as she or he incorporates directly into Mill’s book a collection of excerpts and observations from other works on related topics. We’d be remiss, however, if we didn’t take this opportunity to remind users of library materials that while it’s fine to mark up your own books as this mysterious person did, it’s never OK to write in a library book.